Your audience will be dazzled once they see you perform these amazing Rope Tricks! 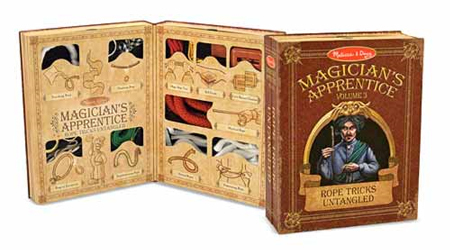 This unique and fun Magic Set includes specialized ropes, accessories, and instructions for more than 17 Rope Tricks that you'll quickly master. Every magician will want this volume of tricks on their bookshelf. Each set measures 18" x 11.5" x 2" and is perfect for magicians ages 8 to 88. Cyber Monday Special: $19.75 - Save 50%! Feel free to browse our selection of other Magic Trick Sets and Trick Cards! We also offer a huge selection of Playing Cards, such as Bee, Bicycle, and more.